Dr. Mommy Dentist: happy new year choco fountain! whew, the last of the fam just left, and we won't have to cook for the remaining time here, which is great, 'cuz i'll be WAY too tired anyway. we had a nice repast - sandwiches made with spiral cut ham, turkey, and different cheeses, hot hors d'houvres, salad, wine. 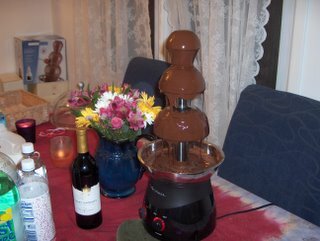 the piece de resistance was indeed the chocolate fountain, which was a gift from nana and grandpa, and dripped over four pounds of melted semi-sweet, gooey confection. and we had the biggest, fattest, juiciest, and freshest strawberries queens could provide for us to dip in, it was marvelous! i didn't want to put it away, it was just so fascinating to watch! here's a pic of the whole ensemble, note the box in the background and how the fountain is "supposed" look. didn't quite work out that way, but is still worked and no one complained. i think the chocolate needs to be a little thinner, we'll have to work on that next time (when i get my house!!!). 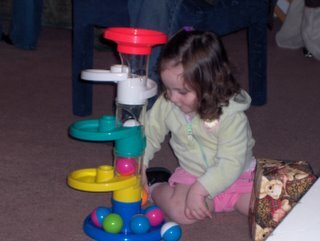 here's a picture of cookie playing with her present from aunt ellen. a rare quiet moment for all. the holidays were great, but now it's time to pack up and get serious!